Home » IKan » ikan See Clearly Now, the Pain is Gone! ikan See Clearly Now, the Pain is Gone! The new ikan VL7 portable 7″ LCD display has given my video productions – and my career – a new lease on life! More on that in a moment — but first a bit of history about “portable” monitors. I began filming weddings and events in 1992 with a Hi8 camcorder that had only a small black and white viewfinder, as color LCDs were not invented yet. Not only was it hard to frame and focus using the small b/w viewfinder, but it was also difficult/impossible to know if the white balance was accurate. One could very easily get back to the studio only to find orange or blue people on the video tape! I’ve always had to wear eyeglasses and never got along very well with a viewfinder, especially when shooting stage events for hours on end. Back in the “olden days,” a portable color TV or production monitor was a part of my kit to be lugged around to every wedding and event shoot, connected to the camera via composite RCA cable. Having the larger, external display allowed me to do a better job with framing, focusing, and white balancing the camera. Years later, Sony came to my rescue by putting a nice little pop-out color LCD on the sides of their popular VX-2000 and PD-150 cameras. No more lugging a monitor and extension cords with me everywhere I went! No more eye strain! No more purple people! 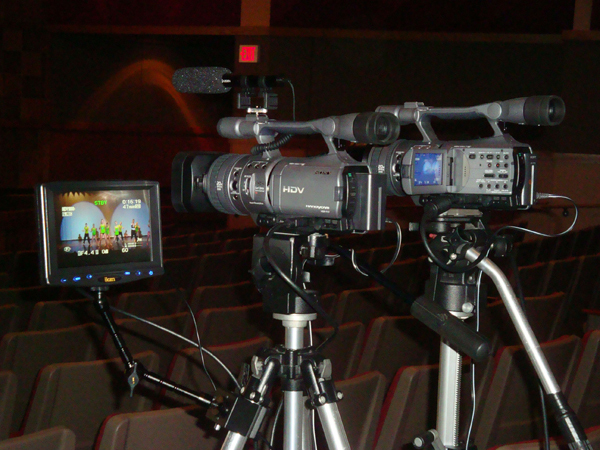 The Sony LCD even got a little bigger and better on my newer Sony FX7 HDV camcorder in more recent years. Everything was going great…and then middle age reared its ugly head. I’ve been “north of 40” for some time now, and I’ve had increasing trouble the past year or so focusing on things very close to my eyes, with or without glasses. Focusing on the camera LCD for long periods causes eye strain, sometimes resulting in blurred vision. Realizing that an AARP membership is perhaps just around the corner, with some reluctance, I got my first pair of bifocals. Unfortunately, they really don’t help with viewing the camera LCD, which is neither close enough for the bifocal lens to work, nor far enough away for “normal” viewing. 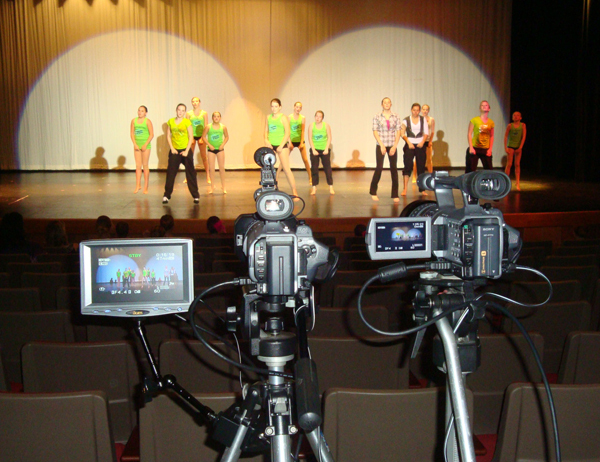 I recently had a very big weekend shooting 6 dance recital shows at 2.5 hours each. In my experience, shooting dance recitals is more challenging than any other event I do. With a wedding ceremony, I can frame and focus a subject, and then relax for a bit before moving to the next subject, allowing my eyes to look around the room for the next shot, but not so with recitals. When taping dance recitals, there are really no breaks other than a few seconds between each act. I have to focus intently on the LCD image as I simultaneously zoom and pan smoothly to keep all the performers in frame, at the same time riding the exposure control to keep up with the constant lighting changes, and of course sharp focus must also be maintained. It’s infinitely easier to frame and focus a close up of a stationary bride than it is to follow 20 kids moving around the stage when they’re the size of ants on the screen! I determined that the camera LCD is just too tiny to stare at all day and thought it would be a wise move to invest in a portable LCD monitor. I’d looked at ikan monitors before, and while I’m sure the high-end models are very nice and worth every penny, they had features like HD-SDI, blue gun, and video pass-thru that I’d likely never use, and thus didn’t want to pay for. More recently, ikan released the VL7 monitor with HDMI input which seemed a perfect fit to my needs – and my budget. The VL7 has a 7″ diagonal screen with 800×480 resolution, switchable between 4:3 and 16:9 display modes. It weighs just over a pound, and one HDMI and two mini-jack composite video inputs are available, with one headphone output. The lower front panel features backlit buttons for power and input, and menu settings which provide onscreen feedback to adjust brightness, contrast, saturation, and sharpness. Underscan and Peaking functions are also available. The base VL7 comes with an AC adapter, swivel shoe mount adapter, and two AV adapter cables for the composite AV inputs. A Deluxe Kit is available that adds a battery plate (your choice of Sony, Canon, or Panasonic), battery, charger, and case, but I opted for just the monitor and optional Sony battery plate, as I already have plenty of Sony L-series batteries and chargers that are compatible with the VL7. The standard ¼-20 mounting threads in the bottom of the VL7 allow it to be mounted directly to the camera accessory shoe using the included swivel-mount shoe adapter so that the VL7 can be turned side to side or tilted to provide the optimum viewing angle. Constructed of metal, the adapter seems very sturdy compared to a similar mount I got recently from the local camera shop, which turned out to be mostly plastic. For most stage events that I tape, I’m seated on a tall folding stool. This has the dual benefit of being more comfortable than standing for hours on end, while also keeping my head (and tripod) lower for the benefit of folks seated in the first couple of rows of stadium seating to my rear. If I am seated, mounting the VL7 atop the camera would force me to look up the entire time, and would also have the LCD sticking up into the view of those behind me, causing a distraction. I decided to also purchase an ikan Articulating Arm to provide an alternative mounting solution. I was torn between getting the 6″ or 10″ model, but decided on the latter and am glad I did. Both models have ¼-20 studs on ball swivels at either end, and the arm itself pivots in the middle. If you’ve never used one of these devices, they are just really neat! Loosening the knob at the arm’s pivot point simultaneously loosens the ball swivels at both ends, so you can really achieve practically any mounting position you need very quickly, then lock all 3 joints with a simple twist of the knob, and it’s very rigid when locked. The arm comes with a shoe mount attachment, which I didn’t use since I didn’t want the monitor on top of the camera. I tried the shoe mount in the studio and found that when hanging the VL7 off to the side using the arm, the added leverage put a lot of stress on the camera shoe and was actually flexing the plastic top part of the camera if I put any pressure on the VL7 with my hand! This was on a prosumer Sony FX7 camera – more professional models should have more robust mountings, but I learned I would have to just use some caution and common sense when mounting any larger accessory on a shoe. To be clear, there was no issue mounting the VL7 directly atop the shoe. It was only when I extended the articulating arm out to the side with weight on the end of it that I became concerned with the structural integrity of the camera’s carry handle. Since I wasn’t using the shoe mount adapter, I needed a way to mount the arm to my tripod. The ikan rep told me they’ve developed a universal clamp for this purpose, but that it wasn’t quite shipping yet, so I ordered a clamp from another vendor. The one I got will mount to any tripod leg, pole, table edge, or similar sturdy attachment point with a diameter between .5″ to 2.5″, and provides ¼-20 female threads to connect the ikan Articulating Arm (as we go to press, the ikan “Elements Pinch Clamp” is now listed on ikan’s website). Clamping to a tripod leg, I was able to securely position the VL7 at a comfortable height, angle and distance that provided the perfect viewing experience, just below my line of sight to the stage. I’m very pleased to say that I made it through the entire weekend without eye strain and was able to work very comfortably using the VL7, in a situation that would otherwise have been uncomfortable at best, and likely would’ve affected the quality of the production at worst. r, meaning quality is a very subjective term. Personally, I’m very happy with the picture quality and feel that the VL7 was an excellent investment. ikan makes other LCD models with resolutions from 1024×600 up to 1366×768, but without doing a side by side comparison with resolution charts, I can’t say how much different they would look from a VL7. If you’re working on high-end productions with high-end gear, then you’d likely opt for a higher-end ikan display to suit your needs and budget. The image on the VL7 looks very good to me. I see no pixelization or “stairstep” edges on the video or text overlays coming out of my camera. The picture looks clean and sharp and provides several times the real estate of the camera LCD. In other words, even though it is not a full HD resolution, the image is very clean and makes it easy to verify focus, which is much more critical when working with HD. I feel that the size of the VL7 image is more of a benefit to me than resolution is – it just makes a big picture that is so much easier to see! My camera has a menu setting to toggle the overlay info text on and off for the video output, and I chose to leave it on, so I had the camera settings, timecode, audio meters and other important data overlaid on the big VL7 screen, easily readable at a glance. I’ve noticed that some LCD screens in my studio will smear or leave trails with fast panning motion, so I tried doing some exaggerated side to side whip pans and saw no smear at all with the VL7 – the image remained sharp and clear. Overall, I’m very happy with the VL7 and the 10″ articulating arm. I had one problem at the recital shoot, and this is my fault for not taking more time to familiarize myself with the VL7 since I ordered late and it arrived just the night before the shoot. All of the built-in camera LCDs I’ve worked with always show an overscan image – some of the image is cut off behind the plastic bezel of the LCD, providing some extra safe area when framing subjects. With the VL7, I realized (too late) that it displays nearly the entire video image edge to edge, with little or no hidden margins outside the screen bezel. I had continued framing my subjects on the VL7 as I had for many years with the camera LCD, not taking into account the larger image I was seeing, so some of my shots are framed tighter than I’d like. Thankfully, I figured this out before I’d done too much shooting. The VL7 does offer an “underscan” mode, but it doesn’t show any additional image; rather, it just shrinks the whole picture down enough to put some black border around it, so I have to remember to be careful with the framing and leave some extra room at the edges! I’m tempted to take a fat black marker and trace around the outside edge of the screen against the bezel edge to get me back into my comfort zone. Of course I don’t recommend that, nor would I actually do it, but that should give you an idea of the extra area being displayed. I was using the 1080i HDMI output of my HDV camcorder into the VL7 for the recital shoot, but the VL7 also accepts composite video inputs, so I tried the composite feed from my FX7 camera and there is an appreciable quality difference. The image was somewhat softer, which is expected since the camera is converting down from HD to SD, and composite video is the weakest type of analog connection, below S-video and component. HDMI will of course be my first choice for monitoring, but I appreciate the option to view one or two additional video sources, available by toggling the INPUT button, when I want to verify what the other camera(s) are recording. There is also a headphone jack that provides audio monitoring for any of the video sources, an unexpected bonus on such a reasonably-priced portable display. While there is no volume control, many headphones have volume control built into the cord, or it can be added inline easily enough. If you’re working with any camcorder with an HDMI output, or even composite output, and need an affordable, lightweight LCD that can run off AC or battery power, consider the VL7. 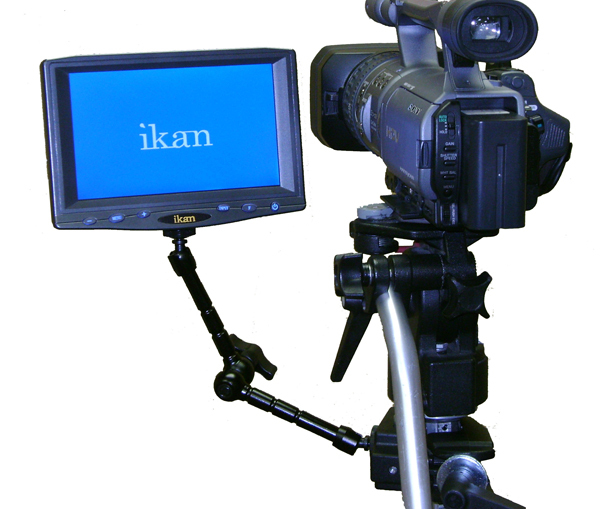 And don’t forget the ikan Articulating Arm, which can be used for mounting just about any accessory like a light, digital audio recorder, video recorder, microphone, or of course an LCD. I showed the VL7 and 10″ Articulating Arm to an associate the other day, and he is also impressed with the quality, features, and pricing of both items, and they are now on his short list of “must have” gear! To learn more about ikan products, visit: http://www.sharbor.com/vendors/KAN.html.